This dress is actually from Shop Stevie which is currently my favorite boutique for a while now. You guys are probably familiar with it from some giveways/posts I did with different reps recently. I absolutely love their clothes and they're super affordable. The worst thing about shopping at boutiques is that there is a limited stock and items usually sell out fast, but Shop Stevie is different. Shop Stevie actually created a Rep Program where you can buy items from the boutique at wholesale prices and sell them on your own page. If you have always dreamed of opening up my own boutique this is the perfect opportunity! You get to pick the items you want to sell on your website and do fun things like pop up shops or giveaways with different bloggers, etc. I have actually fallen in love with items from the main Shop Stevie that were sold out in my size and the Reps came to my rescue because they had the item in stock in my size and most of the time with a special discount (yay!) If you are interested in the Shop Stevie Rep Program click HERE to learn more. Also, please feel free to let me know if any of you do join so I can give you shout outs and buy pretty things from you ;) XO! This dress is stunning babe!! I've ordered a few things from that boutique. Thank you! Can't wait to see what you got! I love this dress so much!! 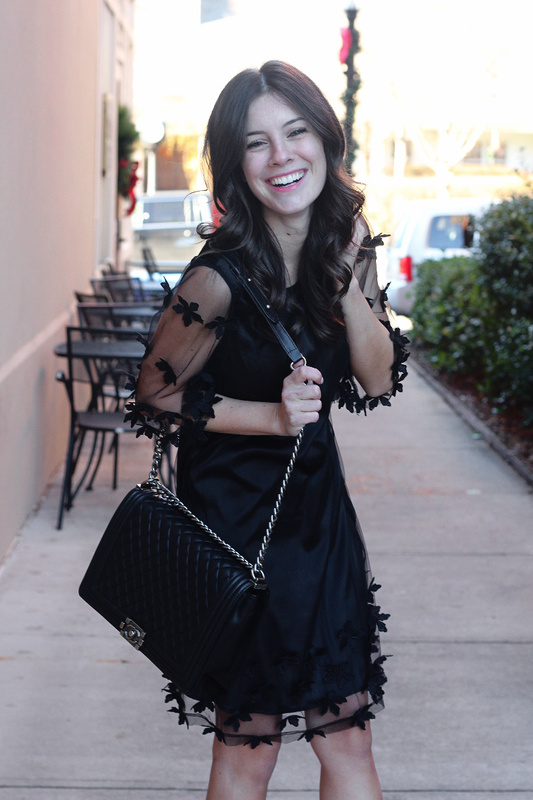 It's rare to find a black dress that is fun & girly like this one! You are seriously the cutest! I love this dress on you. There are so many great things about being a Shop Stevie rep. I love that I have my own little boutique and really love that I determine what I make. I also love that I don't have to worry about signing anyone up. Reps helping others is really just genuine. You'll find that we are all our own shop but work hand in hand really well with all of the other reps. We want nothing but for others to be as successful and for all of our customers to find what they love. If anyone has any questions feel free to ask away! I always love helping answer everyone's questions. Thank you! And thank you for taking the time to write about the rep program from a rep's perspective! This is awesome! I love that dress on you.